Over the past few days we've had the Wheat King and a corn dolly. 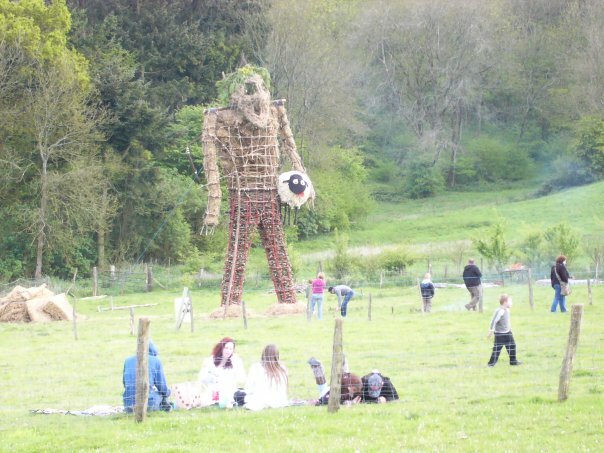 Keeping this appropriate Lammas theme, here's a photo of a huge wicker man that was taken by Debbie Gallagher, author of The Spider's Bride. It was part of the displays at Butser Ancient Farm, an experimental archaeological site in Hampshire. The idea of the wicker man - a large wicker statue that, according to Julius Caesar in his Commentarii de Bello Gallico (Commentary on the Gallic War), was used by ancient druids for human sacrifice by burning men inside the effigy - appeals to those who enjoy the more gruesome aspects of history. Through the cult 1973 movie The Wicker Man, the image of this horrific form of ritual sacrifice is well and truly burned into our consciousness as an icon of pagan bloodthirstiness. Much of the prominence of the wicker man as a structure in modern popular culture and general awareness is down to this film. However, there is little evidence that druids ever really sacrificed people in this way. Julius Caesar was, after all, writing about the Gallic War and could well have been making up anti-druid propaganda. Archaeologists have never unearthed charred remains of wickerwork mixed up with burnt bits of human bone. Nowadays, wicker men are sometimes set ablaze during neopagan festivities - without any living creatures inside, of course. They do look really impressive. Note: The photo is copyright Debbie Gallaghar and is reproduced here with her permission. Please do not download it, copy it or use it anywhere else without her permission. I love the fact that this wicker man appears to have Sean the Sheep under his arm!